Mutated superoxide dismutase 1 contorts itself into strange and unnatural shapes, leading to amyotrophic lateral sclerosis. Research published online October 17 suggests that even wild-type SOD1 can twist into the disease conformation in people who have the sporadic form of ALS. Hence, SOD1 malformations could be a common thread among people with ALS, and therapies targeting the miscreant molecule could have broad applications in the clinic. Thus far, every major gene and protein that has been implicated in a familial form [of neurodegeneration] has also been shown, now, to be implicated in a sporadic form, said study author Robert Brown of the University of Massachusetts Medical Center in Worcester. Citing the broad involvement of amyloid-β in Alzheimer’s, and α-synuclein in Parkinson’s, Brown noted that until this research, the standout has been SOD1. 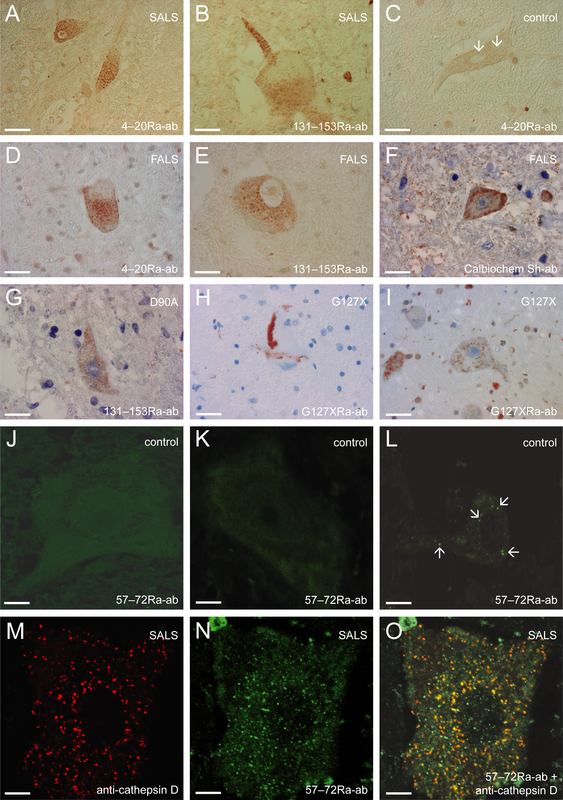 Wild-type SOD1 has been found in inclusion bodies in sporadic cases of ALS, but it was not clear if the SOD1 in those aggregates caused disease. This new research suggests that even wild-type SOD1 could be pathological. ARF briefly covered this research, now published in Nature Neuroscience, at the 2009 Society for Neuroscience meeting in Chicago. Leading the study were joint first authors Daryl Bosco and Gerardo Morfini, with senior authors Scott Brady and Brown. Bosco and Brown each manage labs at the University of Massachusetts Medical Center in Worcester; Morfini and Brady each maintain labs at the University of Illinois in Chicago. A conformation-specific antibody, developed by the Laval University laboratory of Jean-Pierre Julien in Québec City, Canada (Urushitani et al., 2007), was key to discovering misfolded SOD1 in cases beyond the familial forms of the disease. Wild-type SOD1 molecules normally form intramolecular disulfide bonds, homodimerize, and pick up copper and zinc ions. Mutant SOD1 is unstable, and may seed oligomerization (see ARF related news story on Banci et al., 2009 and ARF related news story on Nordlund et al., 2009). Blurring this distinction, Bosco and colleagues hypothesized that the wild-type protein might adopt a similar misfolded conformation, mimicking the mutant’s pathogenic properties. Using the misfolded SOD1 antibody C4F6, Bosco discovered misfolded SOD1 in four out of nine sporadic ALS cases. The work suggests that at least some ALS cases manifest deformed SOD1, even though the gene is normal. Even if it’s not triggered by [mutant] SOD1, you can still end up going through this pathway to pathology, Brady said. Other groups have recently found malformed SOD1 in sporadic ALS samples as well (Forsberg et al., 2010). Neil Cashman of the University of British Columbia in Vancouver told ARF that his misfolded SOD1 antibody lights up even more cases than the antibody Bosco used. There is evidence for misfolded SOD1 in all types of ALS, he said. Since all ALS looks clinically and pathologically the same, perhaps misfolded SOD1 is the final common pathway. How does SOD1 cause problems? Morfini used a squid axoplasm assay to analyze the effects of SOD1 on fast axonal transport. He already knew that introducing mutant SOD1 into the axoplasm disrupts kinesin-based anterograde transport. And when Bosco provided misfolded SOD1 she had isolated from sporadic ALS samples, it had the same effect. It was striking that the result was indistinguishable from the mutant form, Brady said. Since kinesin transport is regulated by phosphorylation, the researchers examined kinase activation in the axoplasm system. The scientists oxidized SOD1 to make it misfold, and found that malformed protein quadrupled activation of the MAP kinase p38, which phosphorylates kinesin to block transport and is involved in the cell’s response to stress, and inflammation. [ALS] is basically a disease of dysregulation of kinase signaling pathways, Brady concluded, and those pathways could have consequences in areas besides transport. If all ALS includes SOD1 pathology, then SOD1-directed therapies could be helpful for all patients, not just the few who inherited mutations in the gene. Scientists are already examining immunotherapy approaches in mice (Gros-Louis et al., 2010). Moreover, the involvement of kinases opens up a wide variety of potential drug targets. I think this is the beginning of a beautiful area of research, said Soumya Ray of Harvard Medical School, who was not involved in the project. It really gives ALS researchers a hope that there will be more drug targets.